So, while hope remains in the air of the disappearing notes at the end of the piece, Miss Goudy’s work presents a proverbial roller-coaster of emotions. She has, in fact, intended that it should be this way, as her lyrical musical fiction imitates life, so to speak. But this is no ordinary work, even if its theme – “romance” – is a common one. The twist, if such a term may be used, is in the rhythmic form – one adopted from the traditional mariachi style of music typical of the Guadalajara area of Mexico. Miss Goudy’s rhythmic sub-text becomes beautifully intriguing as the movements of the suite progress beginning with the son Jalicience mode in the second movement “Son of Sunshine”, in which Andrés Gándara’s vihuela makes its first appearance adding an eloquent touch to the melody. Curiously the instrument does not solo, differing to the luscious harmonics of the ensemble instead. As the summer of the romance turns to “Autumn’s Embrace” Miss Goudy’s huapango rhythmic form turns this movement into a lovers’ dalliance which, as tempos slow down considerably the element of emotional reticence is introduced, which is a portent of the complete withering of emotions in the bleakness of “Winter” movement in a Afro-Cuban rhythmic style appropriate to the collision of feelings that seem to tug at the expression of the characters’ emotions in different directions. Once again this extraordinary ensemble is able to reflect the changing emotions with an excellent interpretation of the thematic content of this work. Of course, all is not doom and gloom and the characters’ world rights itself once again as “Lilacs” blooms before we are ushered into the world of nostalgia with “Remember the Days”, which brings the work to a close. Miss Goudy has delivered a work of extraordinary beauty – both structurally as well as thematically. Keeping the two elements together in a long work such as this is can be demanding, especially if musicians are not kept in tow by a single baton-wielding conductor. We know of no such functionary here, so all of this “togetherness” must be delivered by very tight arrangements; another remarkable achievement on the part of Miss Goudy. 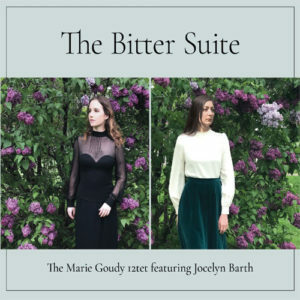 That said, One must reserve special praise for Jocelyn Barth for her eloquent interpretation of this score, and her pristine, high-sprung vocal is superbly bolstered by Miss Goudy and John Nicholson, who also play important roles delivering the poetic elements. But none of this would have been possible without this excellent ensemble fronted by individual soloists in each movement and here, Matt Woroshyl’s soprano saxophone solo in the dénouement of the work captures its “poetry of feeling” with impeccable grace and fire.